Lauren’s EMS career began in 2002, when she worked as an EMT and Field Training Officer. 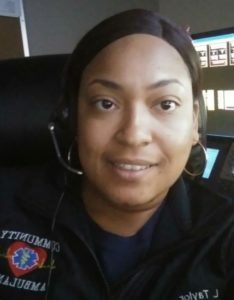 In 2006, she became a dispatcher, serving as a supervisor. On October 1st, Lauren and her partner, Joe, received the radio call for an active shooter from the Standby crew of the Route 91 Harvest Music Festival in Las Vegas. Community Ambulance had been contracted to supply medical services to the festival. Lauren and Joe faced many challenges that night, including not knowing if the Community Ambulance personnel providing standby coverage would go home to their families. Lauren and Joe worked tirelessly in those moments to bring calm to the chaos and get the needed resources to the incident and working hand in hand with our community partners. Undeniably their focus and hard work helped to save countless lives that night. In her spare time, Lauren enjoys cooking and watching sports. She also loves animals.